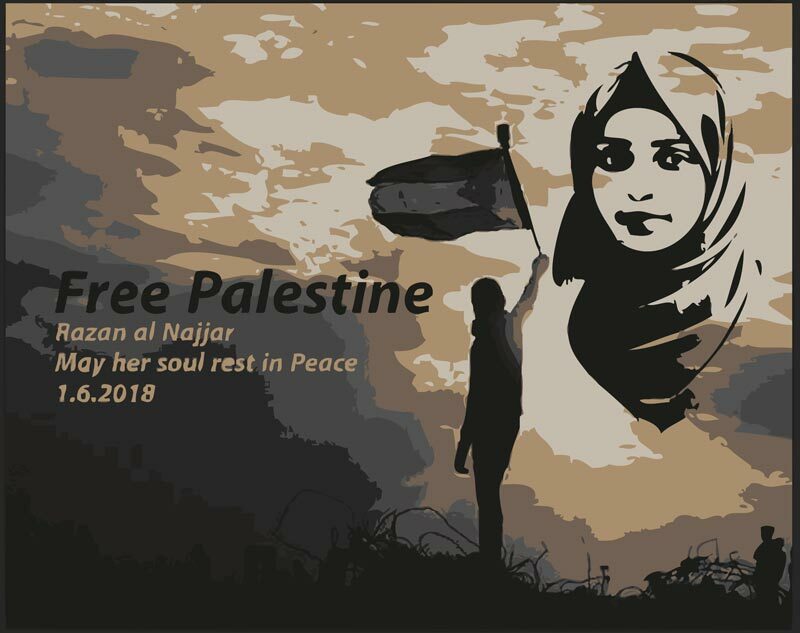 Update On The Murder Of Razan Najjar, 21 Year Old Palestinian Woman, Medic Killed By Netanyahu Fascist Forces In Gaza ! A 21-year-old Palestinian woman, Razan al-Najjar, was shot and killed by Israeli snipers Friday during weekly protests at the Gaza border. Najjar is a paramedic who was treating wounded protesters at the time the snipers shot her. Najjar was the lone death reported on Friday, with in excess of 100 protesters wounded. At least 40 of those protesters were wounded by live fire from Israeli troops. While protest crackdowns are usually heavily covered in the Israeli press, today’s incident was only sparsely covered. This is likely because while Israeli media generally focuses on lionizing the killings as part of a fight against “terror,” the death of a paramedic shot by snipers is particularly embarrassing. So far, the Israeli government hasn’t offered any statement on the killing, but the army said they were “looking into” that matter. Najjar had been a volunteer paramedic for some time, and there were a number of photographs of her treating wounded Gazans circulating around. This makes her a much higher profile victim of Israeli violence than most, and will likely add to regional anger about Israel’s actions in Gaza.